Tags are cost identifiers that can be allocated to actual or planned expense items to then track and analyse in the Actuals and Planning screens and reports. Tags are compatible with any category or extended code that has a Type set to Expense. They can't be used for livestock codes as there is a corresponding income component to these codes. You can create and use as many tags as you want, though we recommend keeping it simple. If you've got 100+ tags, it can get confusing around which tags to use! What can tags be used for? Tags are suited to both short term use, for areas like development projects, and long term use, in areas such as separating animal health and breeding costs for sheep and beef. 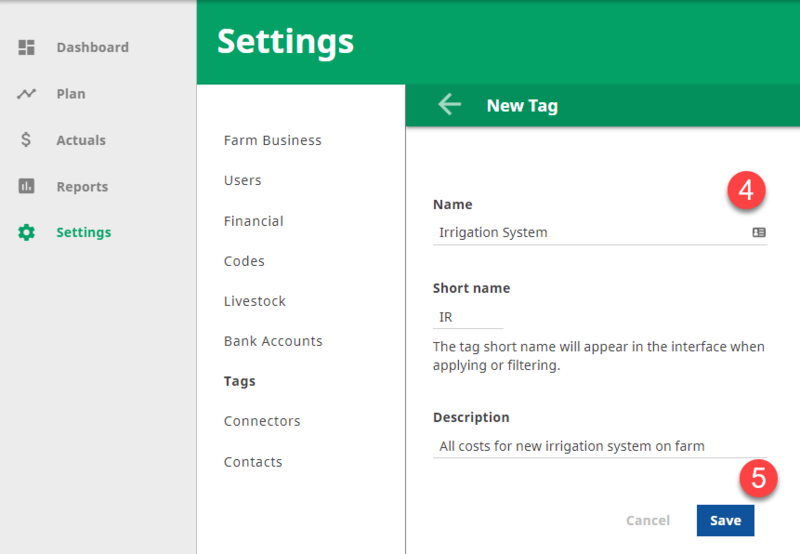 Dave and Sarah are implementing an irrigation system on the farm so want to keep a track of all costs involved, from consent and design through to installation. They also want to track and analyse all animal health and breeding expenses related to sheep in their business. To do so, they create tags for each project. Select Tags from the menu. 4. Fill in the details for your tag, including a name, short name (ID) and a description. 5. Click Save to close. Once a tag has been used in a transaction or planned item, it can't be deleted.